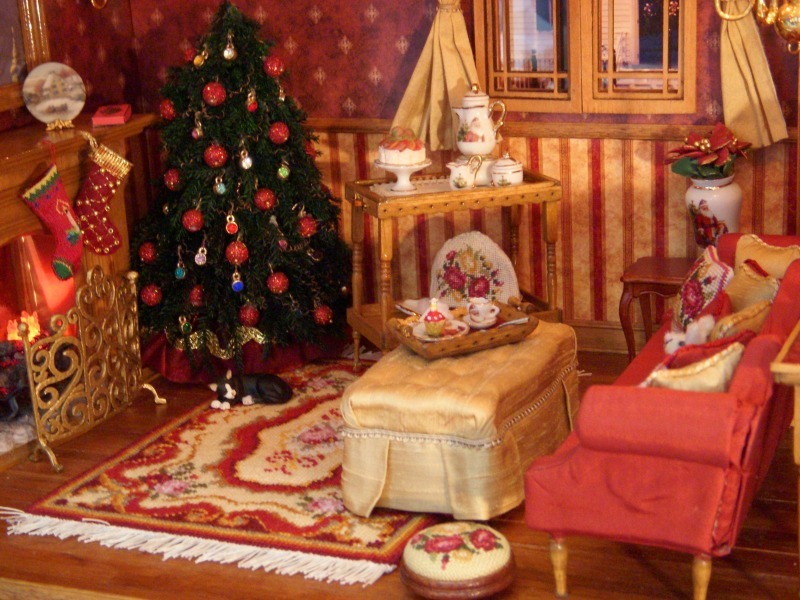 Christmas in July in the doll’s house! 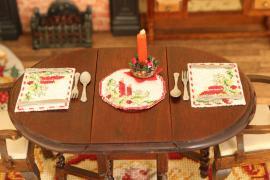 and a kit to make 4 Christmas placemats or one to make a round table centre! Just use the code CHRISTMAS IN JULY at the checkout on my website when you buy any of these Christmas-themed kits, and save 10% on the usual prices. The offer ends midnight Sunday 23rd July. Author Janet GrangerPosted on July 19, 2017 July 17, 2017 Categories Christmas stockingsTags Christmas, Doll's house, Dollhouse, Embroidery, NeedlepointLeave a comment on Christmas in July in the doll’s house! 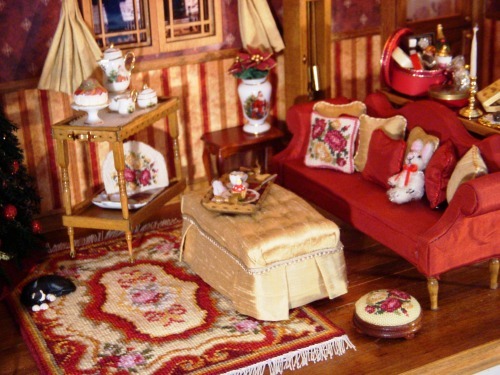 This picture of a room setting was entered in my competition to see who has the most beautiful doll’s house, and reached the finals. It’s just gorgeous isn’t it? 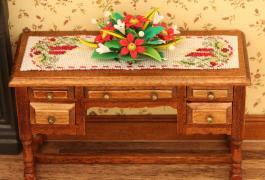 It’s created by one of my customers called Marlene, who lives in the USA. She has used a limited colour palette of burgundy and gold to make this evocative Christmas scene. The picture above is actually just one end of a large room setting. There’s lots of wonderful miniatures in this room! The competition rules required every picture to show at least four pieces of miniature needlepoint, stitched from my kits. 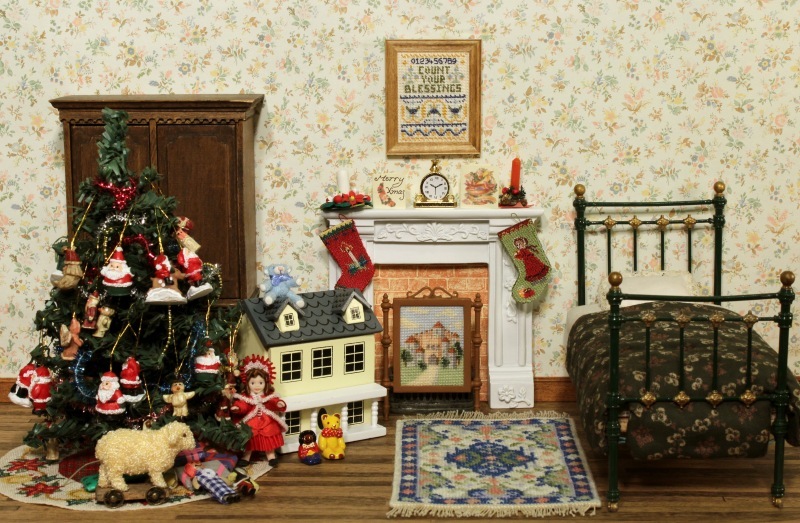 So, in this room, from the left, are: A ‘Candle’ Christmas stocking hanging on the fireplace, a ‘Sarah’ carpet, a ‘Summer Roses’ teacosy on the tea table at the back, a ‘Summer Roses’ footstool on the floor at the front, and finally a ‘Summer Roses’ cushion on the sofa. They all add the personal touch to this wonderful room. 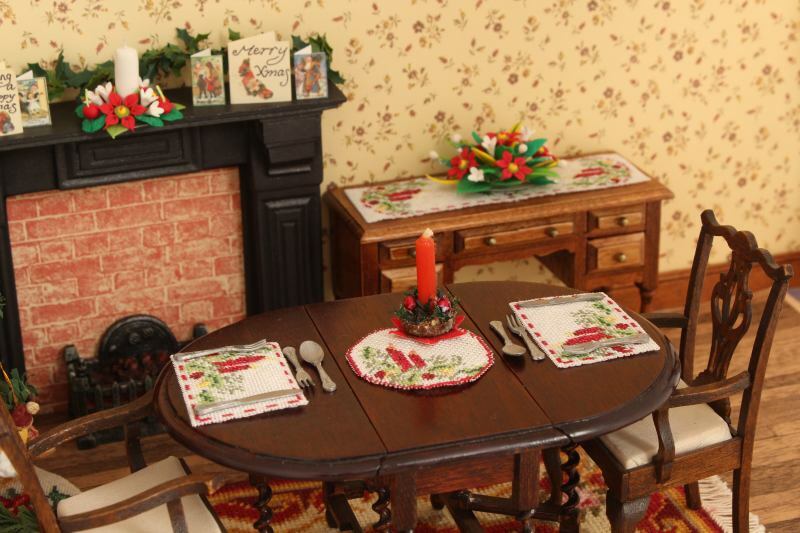 If you’d like to see more inspirational miniature rooms, have a look at the Customers’ Stitching page of my website. If you own a twelfth scale doll’s house, or know someone who does, then here are some ideas for mini-stitching kits that you could either make yourself in the run-up to Christmas, buy to give as kits for loved ones, or drop subtle hints about so that someone else buys them for you! 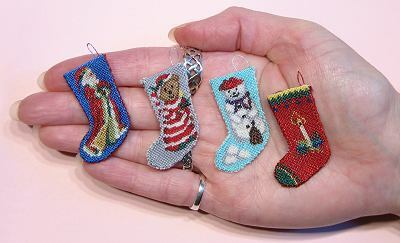 All these miniature needlepoint kits are available now on my website. Firstly, some Christmas stockings. These are stitched on 40 count silk gauze, and when finished, they’re 1 1/4 inches high. They are £9.95 each, available from here. Then there’s placemats (£14.95 for a kit to make four), a long table runner (£12.95), and a round table centre (£8.95) – all on 32 count silk gauze. Then there’s Christmas tree mats (£20.95) on 32 count silk gauze, to stand your tree on. 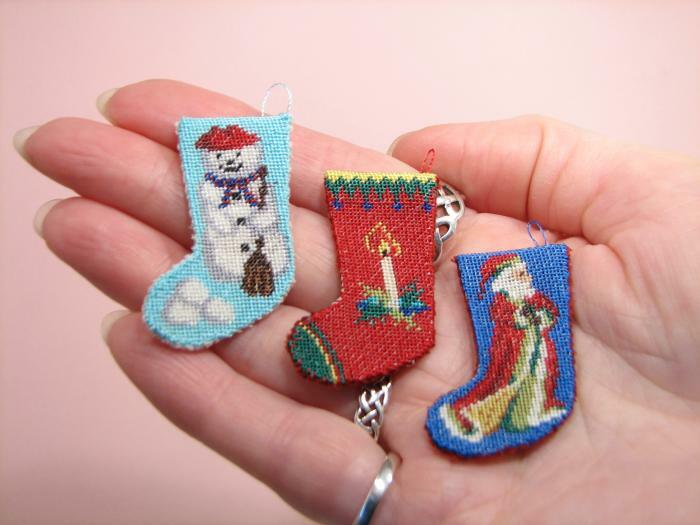 There are also lots of little kits that make good stocking fillers, that aren’t Christmas-themed, but will make any doll’s house stitcher squeal with delight on Christmas morning!! 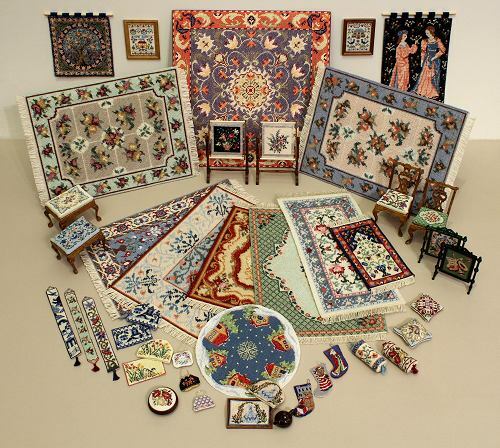 Some of the kits featured above are bolster cushions, round footstools, wallhangings, teacosies and firescreens. There are over 280 different kits to choose from – there’s bound to be something suitable to ask Santa for! I want to thank all those of you who follow my blog, and who keep me motivated throughout the year to keep embroidering. If I didn’t have this blog to post on, I’m sure I wouldn’t get half the needlepoint and stumpwork stitching done that I do! I love reading your comments about the things I post here – keep them coming in 2016! 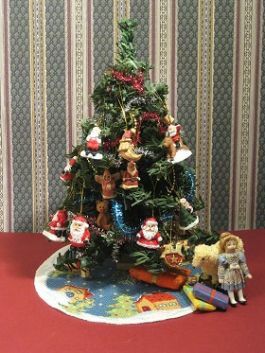 Author Janet GrangerPosted on December 24, 2015 December 23, 2015 Categories ChristmasTags Christmas, Embroidery, Needlepoint, Santa, Stumpwork5 Comments on Have a stitchy Christmas! !